Wearing gemstone necklaces can really make a statement. They are bright, full of colour and can look absolutely incredible. The other wonderful thing about wearing gemstones, is they can have a healing and mythical qualities, which can be very appealing for people. Natural gemstones can also be quite valuable and therefore be a good investment bring quite an impressive return and vintage gemstones can be very good as a collectable. So gemstone necklaces can be really beautiful, can be a great investment and have great earth-like healing qualities making them super popular among celebrities. Speak to us today about designing a beautiful and unique gemstone necklace. 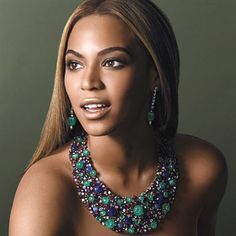 Beyonce wearing a statement gemstone necklace.